Managing order fulfillment operations in the age of e-commerce means coping with all aspects of “more” for the customer. More as in more single-line orders, more special packaging, and especially more when it comes to quicker, faster delivery options. Online customers increasingly expect to be able to choose next-day or even same-day delivery options. Many expect a free delivery option with the assumption that their goods will show up reliably in a matter of days. 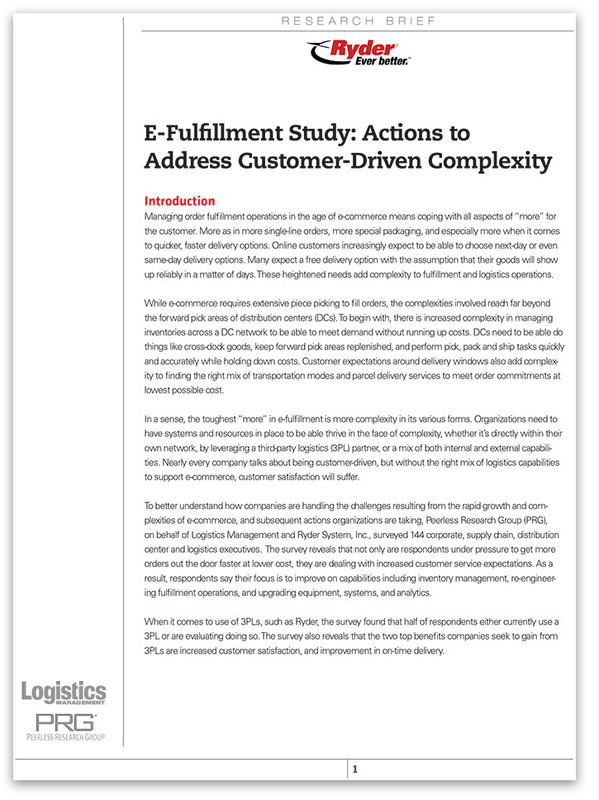 These heightened needs add complexity to fulfillment and logistics operations. While e-commerce requires extensive piece picking to fill orders, the complexities involved reach far beyond the forward pick areas of distribution centers (DCs). To begin with, there is increased complexity in managing inventories across a DC network to be able to meet demand without running up costs. DCs need to be able do things like cross-dock goods, keep forward pick areas replenished, and perform pick, pack and ship tasks quickly and accurately while holding down costs. Customer expectations around delivery windows also add complexity to finding the right mix of transportation modes and parcel delivery services to meet order commitments at lowest possible cost. In a sense, the toughest “more” in e-fulfillment is more complexity in its various forms. Organizations need to have systems and resources in place to be able thrive in the face of complexity, whether it’s directly within their own network, by leveraging a third-party logistics (3PL) partner, or a mix of both internal and external capabilities. Nearly every company talks about being customer-driven, but without the right mix of logistics capabilities to support e-commerce, customer satisfaction will suffer.